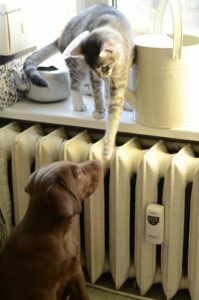 Pet owners with allergies know—even hardwood floors can collect pet hair, and it’s hard for a standard vacuum to keep up. If you’re looking for a new pet vacuum that works great with your hardwood floors, there are a few choices that definitely stand out among popular models on the market today! The best model for you will depend on the size and layout of your home. Hardwood floors present a unique set of concerns that carpeted floors don’t. Vacuum cleaner wheels and brushes need to be non-scratching, and suction power needs to be strong in order to get the dust out of the nooks and crannies in the floorboards. So which models get the job done without damaging your beautiful hardwood floor? We combed through expert reviews, Consumer Reports, and customer ratings to see which models perform the best for the price. Quick take: An inexpensive stand-up bagged model with great performance and tons of useful features. The Hoover T-Series WindTunnel is a popular line of vacuum cleaners that earns top marks in consumer tests and user ratings. It’s our top pick for its quality pet hair system and high-rated all-around performance—all offered at a very affordable price. The UH30310 is the bagged version of the WindTunnel series. Bagged models are great for homeowners with allergies because they keep dirt intact, agitating less material that exacerbates allergy symptoms. Throwing away a full bag is also much simpler than trying to empty pet hair from the canister of a bagless model. The WindTunnel is an upright model with a number of features made to accommodate the cleaning needs of pet owners, as well as many components that can help remove allergens from your home. It includes a power brush, upholstery tool, and crevice tool, as well as 5 carpet brush adjustment heights to tackle pet hair, dust and dirt on any surface. The stretch hose for the UH30310 is 12 feet long, and the power cord is 30 feet. Hoover’s Pet Approved WindTunnel System (P.A.W.S.) is an interesting and useful feature designed to pick up more pet hair and embedded dirt while minimizing blowback and scattering of dust. It also comes with two hand tools designed to pick up pet hair—a pet upholstery tool and an air-powered pet hand tool. Hoover is one of the best known and oldest names among vacuum cleaners, and the WindTunnel series is a further testament to the quality of the brand. The WindTunnel UH30310 earns high praise in reviews from owners for its effective performance and low price. The UH30310, according to users, provides excellent suction, easily removing pet hair, dust, dander and other allergens from surfaces. The bags for this unit are activated carbon HEPA, designed to filter and trap both dust, pollens and odor-causing agents. It offers a complete package in one machine—not only does it perform well on hardwood floors and carpeting, but also effectively tackles more challenging surfaces like upholstery, drapes and stairways. The 5 different brush levels and extra attachments allow homeowners to remove pet hair from every room in the house. For a stand-up model, the UH30310 is relatively light at only 17 pounds. Between the 30-foot power cord and the light weight of this unit, owners have the freedom to move this one around their home with ease. The P.A.W.S. system does a great job at removing hair from every kind of surface, according to owners. Both the air-powered hand tool and the pet upholstery tool feature rubber wipers designed to pull more pet hair from fabrics. There are a ton of small but useful extra features added to this model, as well. For example, there is an indicator light to notify users when their bag is getting full, and a clean-drop bag button to drop full bags into the trash without touching them. One of the biggest downsides of purchasing any bagged vacuum cleaner is having to purchase replacement bags. Extra bags are not expensive; however, for individuals with allergies, we believe this small inconvenience is worth it. A few users wished that the attachment hose was longer, and some complained that the motor was louder than average. A handful of others also found it unwieldy to move around, although most reviews suggest the opposite. 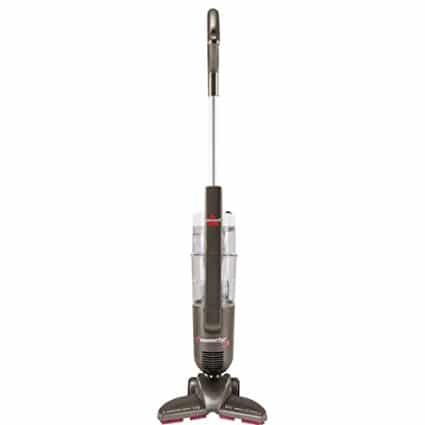 The vast majority of reviewers say this vacuum offers great performance at a low price. The Hoover WindTunnel UH30310 is great not only for hardwood floors, but can also effectively remove pet hair from a myriad of surfaces around the home. With tons of useful features, a versatile design, powerful suction, and an affordable price point, the UH30310 is our top pick for homeowners with hardwood floors. For those who suffer from allergies, the UH30310 can provide inexpensive and effective relief. Quick take: A high-caliber, feature-heavy pet vacuum with cutting-edge technology and design. If you’re willing to spend more on your next pet vacuum, the Dyson DC65 Animal is definitely worth a look. This high-powered pet vacuum earns near perfect ratings from owners, and glowing recommendations from expert reports. The DC65 Animal is a futuristic-looking upright vacuum that’s part of Dyson’s highly regarded Big Ball line, and this model is designed specifically to tackle the task of removing pet hair from a wide variety of surfaces. The DC65 features the iconic Dyson ball design, with the body of the vacuum perched on top of a ball for better maneuverability. This allows users to easily steer the vacuum into the places that normal vacuums can’t reach with a tighter turning radius. Though it’s not designed solely for hardwood floors, it has a number of hard surface-friendly features. The DC65 has a self-adjusting base plate, automatically adjusting the gap between the base and the floor for better suction across any kind of surface. Many owners of this vacuum report that the DC65 Animal picks up dirt and dust they didn’t even know they had. This pet vacuum excels at sucking up microscopic particles that other models miss. That’s good news for homeowners with allergies. The self-adjusting base is a useful feature for those who have both hardwood and carpet in their home. It performs equally well on hard floors and carpeted ones, effectively and conveniently removing pet hair and other allergens from every room. It’s also highly maneuverable, according to owners. This vacuum handles well around tight corners and allows owners to get those hard to reach spots. Most say it takes a moment or two to get used to, but once you get the hang of it, the ball technology makes handling this vacuum easier than traditional designs. The DC65 Animal also comes with an impressive array of attachments that address every conceivable surface in the home. There’s a stair tool for the vertical edges of stairs, a turbine tool for removing pet hair from upholstery, a stiff bristle brush for dislodging ground-in dirt, a soft dusting brush for delicate surfaces, and a multi-angle brush with extended reach for cleaning fans, lights, and the like. One of the more common complaints about the DC65 was the lack of onboard storage for the attachments—the body of the vacuum only has two different holders for the myriad of accompanying tools. Another potential inconvenience in the design of the Ball vacuums is that the ball gives this vacuum a higher horizontal profile, so you may not be able to push it under some furniture without bumping the underside. To access these areas, you will have to use one of the attachments. For those with the budget, the DC65 Animal is well worth the price. It offers some of the best suction of any vacuum on the market right now, and users report it collects dirt, dust and allergens that other vacuums miss. Dyson’s ball technology also offers great maneuverability not found in most vacuum cleaners, which makes this a great choice for people who can’t move around as easily. With its high performance, smart, modern design, and a host of useful attachments, the DC65 Animal can make your home allergy-free! Quick take: An inexpensive, lightweight and compact hard floor pet vacuum with a unique design. If you aren’t looking to spend very much on your next pet vacuum, we recommend checking out the BISSELL PowerEdge Pet 81L2A. This model is designed specifically for hard floors, and it offers a lot, despite its lower price. The PowerEdge 81L2A is a lightweight, highly maneuverable bagless vacuum. It weighs just 7 pounds and has a power cord length of 20 feet. This pet vacuum is notable for its interesting V-shaped design for the base. According to BISSELL, the V-shape allows you to capture large and small debris without the use of a brush roll. The head also swivels to navigate around furniture, and has rubber feet to attract pet hairs. This model earns high ratings for such a low-cost vacuum. The BISSELL PowerEdge 81L2A packs a lot of cleaning power, partially due to the unique design of the base. The V-shape pushes larger objects to the center of the base, while vacuuming up smaller debris at the edges. The base shape is also great for tackling hard to reach corners, nooks and crannies. This tiny vacuum also packs a lot of suction power. It can easily handle large objects that most vacuums can’t, including spilled dog food and kitty litter. As any cat or dog owner knows, cleaning up after your pet isn’t always limited to their hair. When you are cleaning up hair, however, the PowerEdge 81L2A is great at that, as well. The light weight makes this vacuum very easy to move around the house, and the thin body and small footprint can be stored easily in the back of the closet. The PowerEdge 81L2A does have a few shortcomings when compared to more expensive models. One of the most common complaints was the length of the power cord, which will likely require most homeowners to unplug the vacuum and plug it back in when switching rooms. Many owners also reported that the canister of this vacuum needs to be emptied frequently. Emptying out this vacuum is relatively easy, but the smaller body of the 81L2A means that it doesn’t have the capacity of larger models. Furthermore, the 81L2A is designed specifically for hard floors. Compared to the other vacuums we reviewed, this one is the least versatile. Some reviewers say it works well on short carpet, but if you need a vacuum that can also tackle upholstery, high carpets, and drapes, this may not be the vacuum for you. If you’re on a budget, the BISSELL PowerEdge 81L2A is a great model to check out! The price of the PowerEdge can’t be beat, and owners report that this compact little vacuum makes cleaning up pet hair a breeze. It has some shortcomings—as you might expect at this price—but it offers a compelling set of strengths. With a lightweight body, the ability to pick up large objects, and the useful v-shaped head, the 81L2A competes with vacuum cleaners many times the cost. Which Hardwood Floor Vacuum Cleaner Should You Buy? Our top pick, the Hoover T-Series WindTunnel Pet UH30310, is an affordable bagged vacuum cleaner that has earned many fans for its versatility and performance. Hoover’s P.A.W.S. system removes pet hair with ease and seals it activated carbon HEPA bags. We strongly recommend it as the perfect balance between high performance and good value! For those who are willing to spend a little more for a lot more performance, we recommend the Dyson DC65 Animal. This high-end vacuum cleaner uses cutting-edge technology to clean dirt, dust and pet hair from every surface in your home—including the particles you can’t see. The iconic Dyson ball makes handling the DC65 a breeze, and the host of attachments will leave your home allergen-free! On a budget? Our top affordable pick is the BISSELL PowerEdge Pet Hard Floor 81L2A. This lightweight, compact vacuum is designed specifically for cleaning pet hair off of hard surfaces like hardwood and tile. The V-shaped base effectively tackles both large and small objects, and fans say this is one of the best pet vacuums for the money! Looking for additional options? Head over to the Amazon best sellers page to see the most popular hardwood vacuums! Am I Allergic To Cats? Dogs? Take our quiz! How Clean Is Your House Really?